Sleep has always been a challenge for Bennett, so much so that we make sure nothing disrupts it. We’ve done the same bedtime routine for years, complete with having him wear a bedtime diaper, reading him two stories and giving him two big sips of water right before lights out. We keep the bathroom light on, the room temperature cool, and hope that he sleeps through the airplane noise. Bennett asleep holding Peppy, his lovey. Before he started sleeping through the night at age seven, nighttime potty training wasn’t even on our radar. It seemed cruel to take away the GoodNites and give him yet another reason to wake up — soaked through and smelling like pee, no less — in the middle of the night. Not to mention I didn’t fancy stripping sheets in the dead of night, either. We suspected that was his M.O., but we had no proof. And anyway, the routine was comfortable and it worked. 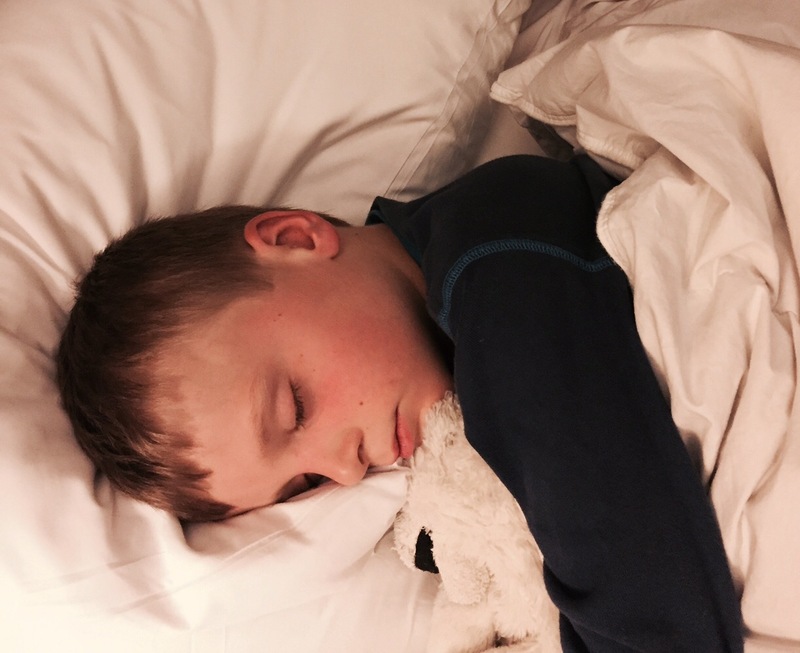 I feared that taking away the diaper and the bedtime water — two crucial parts of the nighttime routine for Bennett’s autistic brain — would be cataclysmic for all involved. Picturing the bedtime meltdown, I was okay with buying GoodNites for eternity. But one night last week, Bennett botched his plan to continue wearing nighttime pull-ups into adulthood. He was having a hard time settling and he ended up using the bathroom (No. 2) at about 9:30. At that point I checked his diaper and saw he had already peed in it (while awake! ), so I put him in a new one. When he woke up at 6:30 the next morning his diaper was dry. There it was, proof that his bladder is mature enough to hold urine all night long. And also proof that when given a diaper (and water at bedtime), Bennett will pee in it rather than the toilet. It’s like we’d been enabling him. At bedtime, Bennett was not down with the new rules. He refused to put on underpants or his sleeper (I had to mostly dress him for bed that night) and even ran to the bathroom to try and fetch a GoodNite (I had hidden them). When it came time for the bedtime water, I reiterated the new rule and was met with resistance: “Water, Mommy. Please. Please? I want water! Please, Mommy!” I mean, it was rather sad, like he was approaching dehydration in the desert, but mean Mommy wouldn’t let him slake his thirst. It wasn’t the tantrum I had envisioned, but it did take him a good two hours to fall asleep, and then he was up about three times in the night and he peed in the toilet at about 1 a.m. I imagine the GoodNites had become a sort of security blanket and he was scared to sleep without one. He awoke nice and dry in the morning. Success! It’s been a week now and Bennett has only had two accidents, both early last week — one because we weren’t strict enough with the water rule in the evening, and another because he had swimming one night and I think he swallows a lot of pool water. The crazy thing is, he now wakes up dry and goes about his morning of watching Super Why and eating breakfast without using the bathroom first. Mr. Iron Bladder can evidently hold it for 10 or 11 hours. To think of the money we could have saved if only we’d said goodbye to the GoodNites earlier! I jest, of course. Who knows if Bennett would have been ready even six months ago? As the week has gone on he’s accepted the fact the diapers are gone and that water ends at dinner, forming a new routine in his head. He’s settling better at bedtime and sleeping through the night again. Really, it hasn’t been as painful as I thought, and I can breathe easier knowing I won’t have to source astronaut-sized diapers for Bennett in a few years’ time. This entry was posted in Parenting and tagged night time potting training, potty training a kid with special needs, special needs parenting, special needs parenting challenges, special needs toilet training techniques. Bookmark the permalink. Yayyyyyy!!! Great milestone! Grandma is excited too!